An executive health screening at an international hospital has many benefits related to preventative health. The screening tests for a variety of health indicators including radiology tests to inspect internal organs and bones. One of the important tests performed is to measure bone thickness of the patient to determine if there is bone loss. The test is called a Bone Densitometry (DEXA) and it is commonly used to diagnose osteoporosis and to determine the risk of developing fractures. It works like an X-Ray and images the lower spine and hip. Measurements are made on the images and compared to the bone mass of a young adult (T-Score) and the bone mass of other people in the patient’s age group (Z-Score). If the bone mass is less than the average, it will be highlighted and your risk of developing fractures will be assessed. The doctor will be able to give recommendations for increasing bone mass which may be related to diet and exercise. Bone health is very important to monitor and this test is helpful to do that. Most people reach peak bone mass at age 30 and then experience slight loss of bone mass as they age. Many factors contribute to bone mass including diet, physical exercise, age, and hormonal levels. Maintaing a healthy bone mass will reduce the risk of fractures and changes in posture throughout the aging process and allow for optimal mobility. 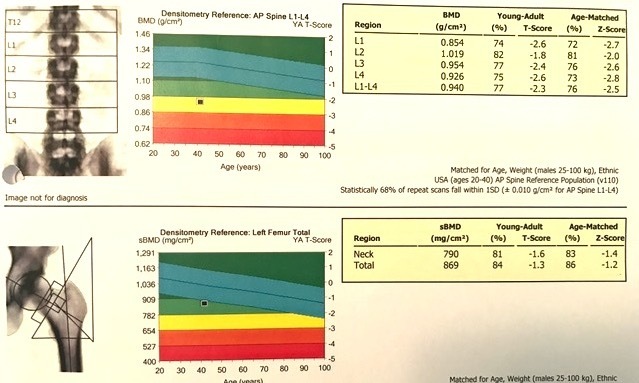 Results from a Bone Densitometry test show thinning of lower spine bone mass.